We are proud to offer honey that is as close to pure as it can get. It goes from the hive to the bottle without any additives or heating. One of our favorite things about honey is the different flavors. Our honey has a different flavor almost every time we get a new batch. Sometimes it's dark, sometimes it's light. Sometimes the wonderful aromatics will knock you over and other times the aroma is more subtle. Most of the time, if using on a biscuit or in a recipe, it takes a fraction of our honey to equal that from the store, because ours has a flavor that is excitedly more potent. It all depends on the location of the hives and the flowers which bloom. That is part of the excitement of local honey. Once someone experiences our honey, they rarely consider the stuff at the store as the same product. Because of the limited supply, our honey sells out very quickly. ​Contact us today to see if we have some available! Best honey ever! Reminds me of the honey my parents got from neighbors when I was little. 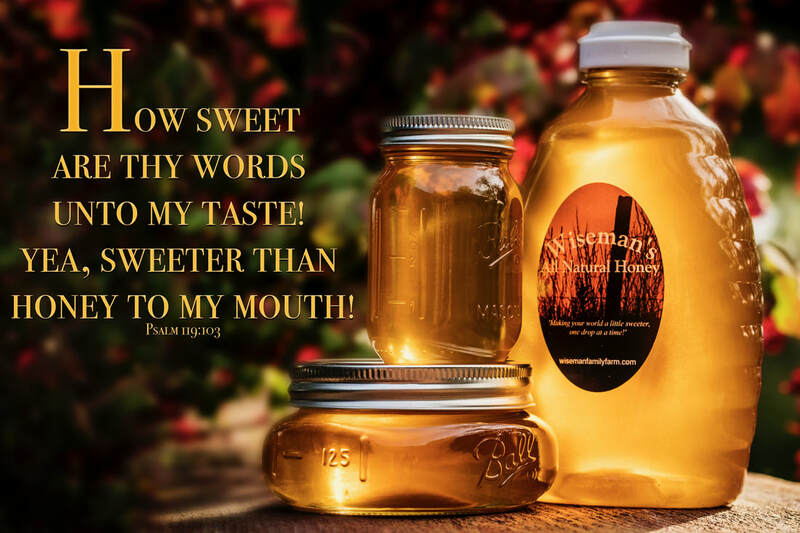 "Wiseman's honey is pure and delicious! We appreciate having a local & reliable source for this beneficial natural product." *We do not use any chemicals in our hives. *We do not heat our honey during extraction. This ensures the customer gets all of the nutritional benefits of natural honey. *We plant bee friendly buffer strips around our hives and in other strategic areas. This allows us to keep sprayers away from our hives and gives the bees forage during slow bloom periods.